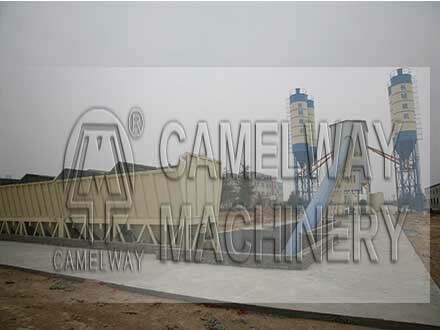 Zhengzhou CamelWay Machinery are specialized in the production of concrete mixer and has an extensive user base in the country, enjoying a high popularity. Some products are exported to Vietnam, Laos, Kazakhstan, Mongolia, Russia, Cuba, Brazil and other countries, being highly praised by foreign friends. Today, we will introduce the materials weighing system. Materials weighing system is the key components of concrete mixing station. It can affect the quality of concrete and the cost of producing, and mainly divided into aggregate weighing, powder and liquid weighing three parts. In general, concrete mixing station under 20 cubic meters per hour using superposition weighing way. In other words, the aggregate (sand, stone) with a scale, cement and fly ash with a scale, water and liquid admixtures weighing respectively, then put the liquid admixtures into water. And in more than 50 cubic meters per hour mixing station, most people use the method of independent weighing, and all weighed use electronic scale and computer control. Aggregate weighing accuracy + / – 2%, cement, powder, water and admixtures weighing accuracy + / – 1%. If you want to know more information about the concrete mixer or buy it, you can contact us. Welcome to leave a message. How do I operate a concrete mixer safely?